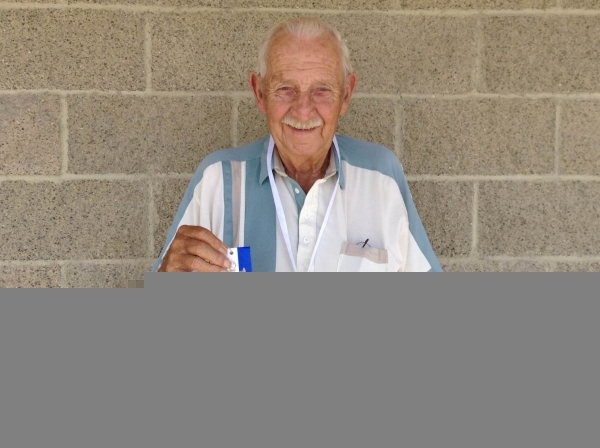 Orville Brown, a longtime resident of Pahrump, placed fifth in his age bracket 85-89, at the 2015 National Senior Games held in St. Paul, Minnesota. The nationals are held every two years in a different city each time and can attract upwards of 10,000 people. The games were held from July 8 to July 14 in the Minneapolis and St. Paul areas of Minnesota. To attend the games, one must qualify in a state competition and be 50 years of age. Brown said he was one of many seniors from Nevada that went and this was his fourth senior games. The three-day competition was held at Como Park Golf Course in St. Paul and consisted of a 54-hole tournament. Brown said the course was difficult and took 7 hours a day to complete. He carded an 89 and said his competition beat him by four to five strokes. Brown plays golf at Mountain Falls three to four days a week and has been playing golf since he was 40. He said he qualifies for the nationals, which are every two years, every time and just enjoys the competition. Despite the grueling competition in St. Paul, Brown took just two days to rest and was playing golf again at Mountain Falls, getting ready to compete in the 2017 National Senior Games in Mobile, Alabama.